The Best Hurricane Window Protection You Can Buy! Hurricanes are not going to go away. That's why you need a Permanent Solution for hurricane window protection. American Hurricane Panels has the solution: Polypropylene Panels which meet Large Missile Impact Testing Standards, along with our patented Hurricane Clamps. Hurricane window clamps from American Hurricane Panels are stronger than the average storm window clips, and when used with plywood or polypropylene panels, make sure that the windows in your house are secure and tightly in place, giving them added strength for your peace of mind. You want to make sure that you have the right clamps so that when hurricanes strike your windows will stand firm and tight. 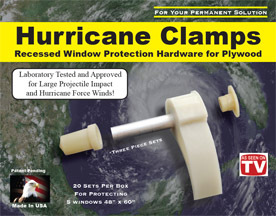 Our patented clamps are incredibly strong, easy to install, and Hurricane Tested and Approved. Don’t spend thousands on disposable Systems! These clamps can be pre-installed permanently on your home's windows and they can also be painted to match the trim on your house. Install them today and be prepared the next time a major storm rolls your way! >>Tampa Bay's Fox 13 News Video Click Here! Tested and APPROVED with 3/4" plywood. Clamps also work with 1/2" & 5/8" plywood as well as the 5/8" Polypropylene and Polycarbonate panels. Permanent, Affordable an Easy to install..!! FREE Delivery within 25 miles of Clearwater, Florida on orders over $500.00. 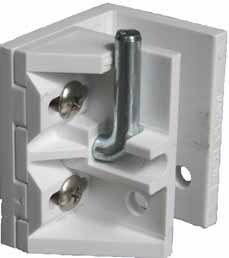 Each kit contains 20 Clamps, Sleeves and Caps which protects 5 average sized windows. Our 43% Glass Filled Nylon Clamp is so strong that it held the weight of this Ford F150 for 12 hours without any distortion to clamp.